Chef Dan McManamy has been cooking for close to forty years. 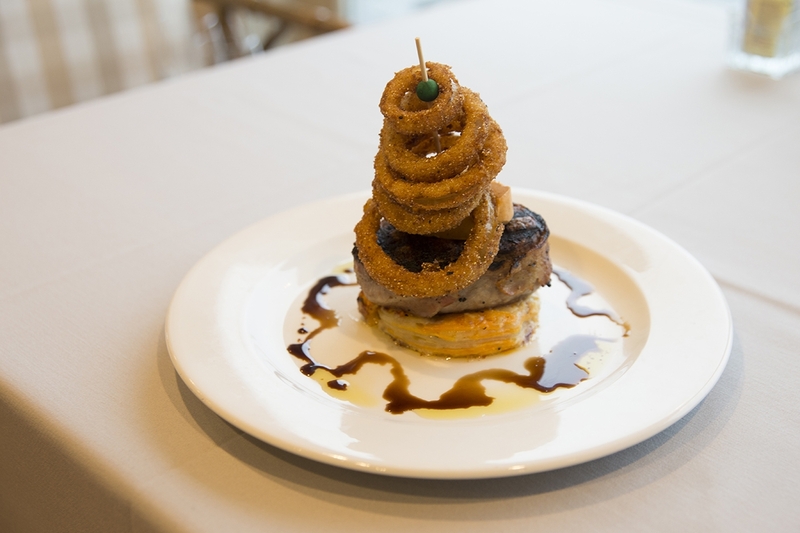 He has been the executive chef at the Old Lyme Country Club for the last eight years. He was previously the chef at Gabrielle’s in Centerbrook, The Straw Hat in Anguilla, as well as numerous other restaurants in Connecticut. Heat cream, garlic, nutmeg, salt and pepper in small saucepan. Bring to boil and set aside. Slice the potatoes very thinly. Grease 9x12 oven-proof casserole dish. Carefully shingle layer of sweet potatoes, followed by layer of russets. Brush with cream mixture, sprinkle with Parmesan, then layer until all potatoes are used. Pour remaining cream mixture over potatoes, sprinkle with remaining cheese, cover with foil. Bake 40 minutes at 350 until knife goes in without resistance. Cool to room temperature and cut into portions. Peel onions, and slice into ½ inch thick rings and separate. Combine club soda and vinegar and marinate onions at least 3 hours. Combine flour and cornstarch in pan. Combine eggs and buttermilk in another pan. In separate pan combine the Panko, cornmeal and Cajun seasoning. Line pans up on table. Dip onions in flour, then egg wash, then bread crumb mixture, then place on empty cookie sheet. Freeze until ready to fry. Soften butter to room temperature, mix in BBQ sauce. Wrap into cylinder with waxed paper. Chill until set. Unwrap and slice into ½ inch thick slices. Refrigerate. Combine ingredients in heavy saucepan. Bring to boil, reduce heat by half and cook until reduced by half. Chill. Fire up grill, and cook the steaks to desired temperature. Remove toothpicks. Heat up portioned potatoes in the oven. While steaks are cooking, fry onion rings in plenty of canola oil until crispy and golden brown. Put a portion of the potatoes in the center of each plate. Place a tenderloin atop each and put a slice of the BBQ butter on top. Insert a skewer into the center of each filet, and arrange the onion rings on the skewer. Drizzle with the coffee syrup and serve.